New research from Harvard University and colleagues from around the globe reveals that the teeth of early hominins grew unlike those of either modern humans or apes, suggesting that neither can serve as a useful proxy for estimating the age or developmental progression of juvenile fossils. For nearly a century, the debate has raged among evolutionary biologists: When working to understand how our early human ancestors developed, should juvenile fossils be thought of as fundamentally human or apelike? A new Harvard study suggests the answer is neither. The study, authored by Tanya Smith, associate professor of human evolutionary biology, with colleagues from around the globe, shows that the teeth of early hominins grew unlike those of either modern humans or apes, suggesting that neither can serve as a useful proxy for estimating the age or developmental progression of juvenile fossils. The study is described in a paper published in PLoS One. Though the teeth may seem an odd place to start, they actually offer Smith and other evolutionary biologists a near-perfect record of how early human ancestors developed. 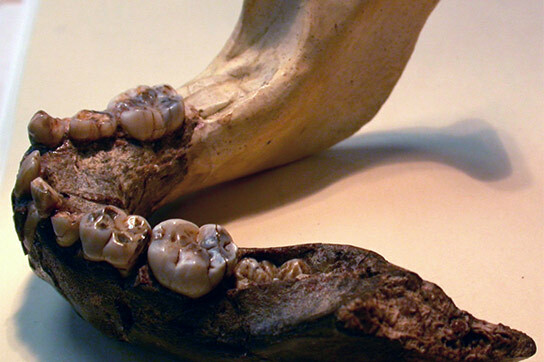 Determining precise ages for fossilized teeth, however, is far easier said than done. For decades, the only way researchers could closely examine fossilized teeth was through sectioning — literally cutting into the fossil — and using microscopes. Smith and colleagues, however, turned to a more modern technique. Using a synchrotron, essentially a particle accelerator that generates high-powered X-rays, they created super-high-resolution images of the internal structure of the teeth that enabled them to identify and count the daily growth lines — akin to rings in a tree — to determine an exact age. To their surprise, Smith said, the images revealed wide variation in the speed of development across the fossil species. Though all developed faster than modern humans, some showed signs of developing as fast, and even faster, than apes. “We found more variation in the fossil humans than we had expected,” Smith said. “What that means is we can’t simply adjust the human or ape model in one direction or the other. Ultimately, Smith said, researchers hope that understanding how our early ancestors developed will shed new light on how the unique development pattern of modern humans emerged. Be the first to comment on "New Research Shows How Early Human Ancestors Were Unique"